Owning a pet is no small thing, despite what most may think. Animals require your love, time, and commitment. These demands can seem trivial and small to worry about, at least when you’re a healthy individual with time to spare. However, when you’re sick, or injured many small tasks become problematic and stressful. How are you supposed to take your dog for a walk when you just had surgery for a hip replacement? If you’re limited to a hospital bed how are you going to clean your cat’s litter box? If you receive a terminal diagnosis who is going to care for your pet when you pass? All these things are very real worries and concerns that all responsible pet owners should prepare for to the best of their ability. These questions shouldn’t automatically make you think owning an animal is an inconvenience. To the contrary, having a pet with you as you go through such struggles can be both peaceful and comforting. What can Pets do for you? Pets have been proven to be great stress relievers. Studies show that having a pet in your life can help patients that suffer from conditions such as anxiety, PTSD, stress, and can help with depression. A pet can help take care of you almost as much as you take care of them. Pet Facts… Simply petting a cat can be a healthy activity as it can help lower your blood pressure. Pets are excellent companions for their owners. Pets bring us love, great stories to share with others, and genuine happiness. 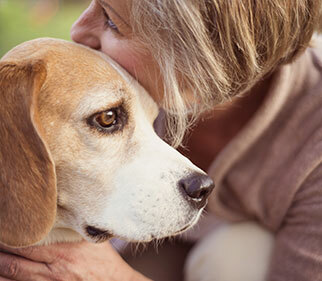 For some patients, pets are the closest thing to family they have close by. They need their pets to love them, and to be there for them during hard times. Pet Facts… Studies have shown simply being in the same room as your pet can help reduce stress. Owning a pet requires owners to be responsive, often making owners maintain exercise routines. Walking a dog, cleaning up after a pet, and constantly moving around to play with an animal goes a long way to help you stay healthy. Pet Facts… Owning pets can help lower cholesterol, reduce stress and blood pressure levels, and promote exercise, which can all lead to a reduced risk of stroke and/or heart attacks. There is no denying that every pet owner has a horror story like a dog eating their owner’s work shoes, a cat using a brand new couch as a scratch post, or if you are a fan of reptiles, a pet snake that somehow got out of their cage. None of these experiences fall under happy memories, but in the long term of being a pet owner how many can say they wish they never owned their pet? Most owners would agree that having a pet in your life is what alleviates hard times and reminds us of how easy it is to love and be loved. Assisted Home Health and Hospice Foundation’s “Hands to Cuddle, Paws to Love” pet program has two furry angels that could use a home. 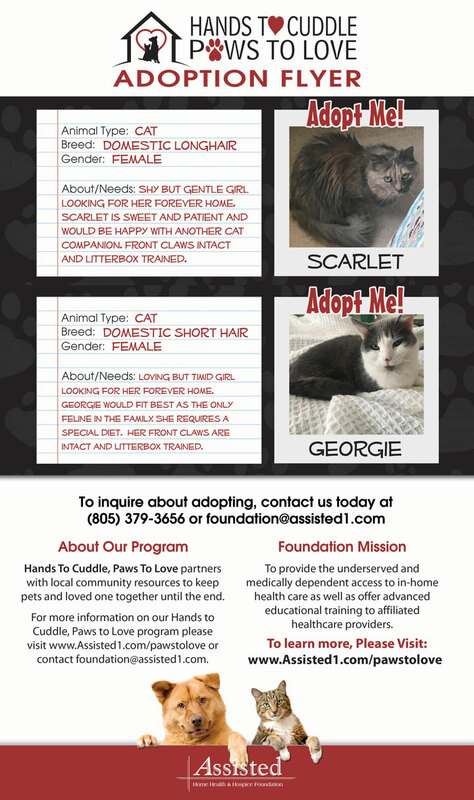 If you or someone you know is looking to add a cat or two to their family please feel free to reach out to us at (805) 379-3656 or contact Erik Helton at foundation@assisted1.com.